Home News Malayalam Ormayundo ee Mugham? – Bharat Chandran Returns for the 4th time!! Ace Scriptwriter Ranji Panicker is back to his business again. Ranji is all set to script for Superstar Suresh Gopi , bringing back the iconic Commissioner – Bharat Chandran for the fourth time in big screen. It was with commissioner in 1994, Suresh Gopi rose to Superstar status. The movie went on to become an All time Blockbuster. The iconic character that portrays him as a man with sheer Manliness was reintroduced to audience in 2005 which ended up as a Megahit in Kerala Box office. 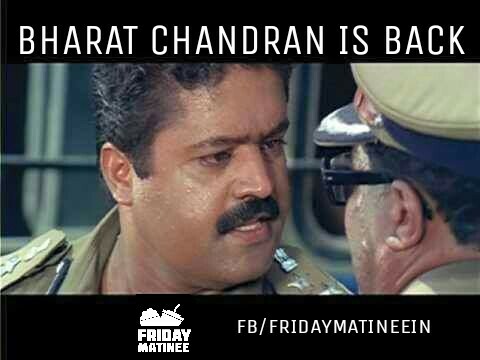 In 2011 Bharat Chandran was brought again to big screen along with another iconic character Joseph Alex portrayed by Megastar Mammootty but the movie couldn’t make an impact after huge initials. Now what is heard is that Liberty Basheer who last produced a movie in 2006 will produce the movie which will either be directed by Shaji Kailas or Ranji Panicker himself.Official announcement is expected from the team soon. Next articleMohanlal’s Villain – Box office Hero?